Great games are interesting, as are terrible ones. Mediocrity’s a bore. Too bad Nintendo’s newest Kirby game is just that. Kirby Star Allies is the Nintendo Switch debut for a franchise that was on a hot streak in recent years on 3DS. It boasts the same top designers as 2014’s Kirby: Triple Deluxe and 2016’s Kirby: Planet Robobot (and other Kirby games), but it manages little of the level design ingenuity and even less of the pleasing panache of those handheld games. The trio are all easy games, though this latest makes the earlier two look like boot camp. The trio are also all great-looking games, but this latest lacks a single level interesting enough to replay. This piece originally appeared 3/14/18. We’ve bumped it today for the game’s release. Star Allies is a sugary glide, mostly from left to right, and if you play solo, computer-controlled allies will play much of the game for you. Kirby games always change the formula in some significant way. Triple Deluxe was, as its subtitle implied, designed to showcase stereoscopic 3D graphics. It did by presenting side-scrolling levels that were laid out across two planes of depth, encouraging players to hop between the foreground and background to fight enemies and find secrets. Planet Robobot took Kirby’s signature ability, inhaling enemies and appropriating their powers, and applied that to an upgradeable mech suit for Kirby. The level settings were heavy on technology; one memorable stretch is a run down a city street while enemies drive through intersections, perpendicular to Kirby’s trajectory. 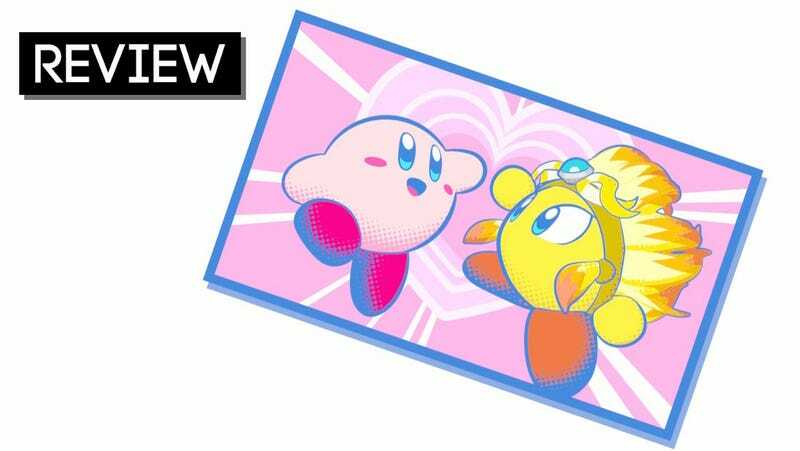 Star Allies’ core concept is that Kirby can now befriend, rather than simply eat, his enemies, roping them into a four-character posse that can combine some of their abilities for more potent attacks. Kirby can absorb a swordsman’s sword-swinging power, for example, and then recruit a flame-based ally who can set that sword on fire. This is arguably a stronger concept than Triple Deluxe and Planet Robobot’s, so it is inexplicable that it has so little positive impact on the game. Enemies die quickly whether Kirby’s sword is on fire, encircled by wind, crackling with electricity, or just plain nothing-special metal. Puzzles in the environment may require specific powers. Maybe there’s a post that needs to be smashed by an electrified hammer, or a rope that needs to be burned by a whip that’s set on fire. But rare is the quandary in the game that elicits the satisfying eureka of a clever puzzle suddenly solved. In an infrequent high moment, Kirby and allies are confronted with two small waterfalls that are drenching a long fuse that needs to be lit. It takes three specially-powered Kirbys to solve that one. No other puzzle in the game makes as good a use of this concept of a crowd of Kirby friends. It is always possible, when an adult is reviewing games targeted at children, that a simplicity that bores a grown-up may delight a child. That could certainly be the case with Star Allies. But I’ve played a lot of Kirby, and Triple Deluxe and Planet Robobot packed their secrets and paved their main pathways better enough to still entertain those of us over four feet tall. Star Allies seems let down by its core concept. Played solo, it sets control of Kirby’s recruitable crowd to the computer and empowers those buddies to bash through most battles without Kirby needing to do much of anything. When a player pushes up on the Switch’s left control stick, Kirby’s allies immediately combine any available powers. Allies attack nearby enemies and can chop through a lot of a boss’ health bar without the player’s input. Beautiful graphics, wonderful animations and rare moments of clever level design. Ally system is well-intentioned but makes solo play too easy and failed to inspire the developers to create levels that make great use of it. Played through the campaign, half in portable mode, half on my TV, mostly solo. Also played several levels in co-op. About 10 hours logged, 84% completion. 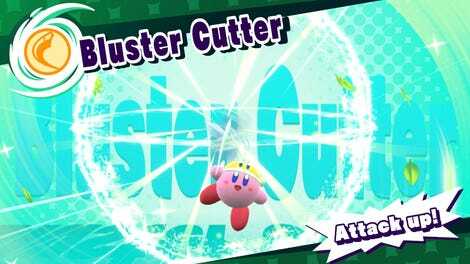 At least, when playing in co-op, all the players have to contribute to combat and must manually combine powers, actually breathing fire onto Kirby’s whip or hopping onto one character’s vacuum nozzle for a special “friend-vac” attack. In co-op, however, the game remains unchallenging, its secrets still a cinch to uncover. In rare instances, levels in Star Allies fork, splitting Kirby’s crew. It’s a hint of a more creative approach to level design that might make for more interesting co-op play. In the drips offered in this game, however, all it does is prove that the portion of Kirby’s party not controlled by the player must play their part of the level by themselves. Alert! We interrupt this review to bring you another review. Recent Kirby games have had mini-games that were interesting enough to be spun out into small standalone games of their own. Star Allies may be half-successful here thanks to the best-named mini-game in years: Chop Champs. The mini-game challenges one to four players to chop tall trees down as fast as they can. There’s one tree per player or computer-controlled competitor, and each chop chucks some log out from the tree’s base, making it shorter. The sides of the trees are lined with dangerous caterpillars and spiky balls. It all might seem simplistic when written out in a review, but your reviewer and Kotaku professional video game expert Tim Rogers found ourselves unable to stop playing new rounds of Chop Champs as if we were eating potato chips. We’ve concluded that this mini-game is not bad, but is in fact very good. Chop Champs in action, while we were learning the game. You should see our runs up that tree now. But... is it possible to knock the tree down? In seemingly perfect runs, we can’t get the final chop and are always left with .25 meters of tree left. Sadly, Star Allies’ other featured mini-game, Star Slam Heroes, is a sci-fi riff on a home run derby contest that’s about as fun to play as Star Allies’ options menu. Chop Champs is where it’s at, and it could well be blown out into its own multi-mode party game, cerebral puzzle challenge, or emotionally complex RPG. We now rejoin your regularly scheduled review of Kirby: Star Allies, already in progress. Star Allies’ best attribute is its graphics. The game is colorful and sharp. In all of his powered guises, Kirby sports enjoyable animations. When he is a spark-waving jester, his hat bobs with his jumps. When he wields water power, his water-hat proves to be see-through. When he gains pro wrestler powers, he can expressively spin and pile-drive his foes. Looks alone, however, aren’t enough. It’s never dreary. It goes by too briskly to be tedious. It dazzles just enough visually to be pleasant to play through. Unaided by its dissatisfying posse gimmick, though, Star Allies has little that makes it special. Even when completion of the game unlocks more challenging modes, Star Allies mostly serves as a reminder that Kirby games seem to function as reflex for Nintendo as natural as breathing is for you or me. This one just checks the box. There are always new Kirby games, including spin-offs usually more than one a year. Some are great, some even intriguingly experimental. Once in a while, they’re just there. Look for Star Allies to be supplanted by better Kirby games on Switch soon enough. Update - 1:20pm, January 3, 2019: A trio of free updates significantly improved this game. They don’t fix the flaws of the pretty but uninspiring main campaign, but they add more characters, extend the Guest Star side mode and, most importantly, add a second campaign that challenges players to use the varied moves of the updated game’s rich and expansive roster. The only catch is that the second campaign can’t be accessed until you clear the original one.